The effects of scattered radiation on image quality in brain imaging with fan-beam collimator were quantitatively evaluated. A commercial gamma camera in conjunction with a fan-beam collimator was simulated using MCNPX code. 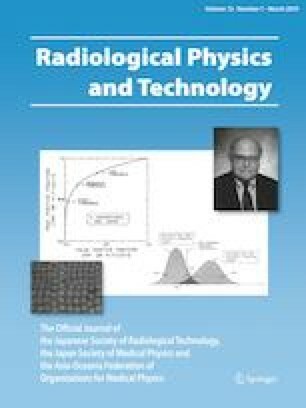 The effects of radiation scattering on image quality were evaluated by employing the Snyder phantom and comparing the system response to an isotropic 99mTc point source in both spatial and frequency domains. The trans-axial spatial resolution of the obtained point spread functions were studied in the spatial domain, at source-to-collimator distances of 2, 4, 6, 8, and 10 cm. At the same distances, the spatial frequencies at 90% (SF0.9) and 10% (SF0.1) of the maximum modulation transfer function were considered in the frequency domain. The maximum difference between the obtained full width at half-maximum in presence and absence of phantom was approximately 5%, while this difference was 14% for full width at tenth maximum. An analysis of system response in the frequency domain demonstrated a large difference of 43% between the obtained SF0.9 values in presence and absence of phantom. In contrast, this difference was a mere ~ 2% between the obtained SF0.1 values. Radiation scattering mainly degrades the image contrast resolution and has no considerable effect on the spatial resolution of the images acquired by the fan-beam collimator. Accordingly, the impact of radiation scattering on image quality was more obvious in frequency domain, and SF0.9 can be considered as an operational parameter for the quantitative assessment of radiation scattering effects on image quality in the frequency domain. This article does not involve any studies with human participants or animals performed by any of the authors. GE Healthcare Data Sheet Report. Discovery NM/CT 670. https://www.gehealthcare.com/-/media/450f4f8bafbb4bd7a18d37185a0dc073.pdf?la=en&hash=37D82292B3CE4B919CA86687894D24B3199E125B. Accessed 10 June 2018.